On M.C. Escher's "Print Gallery" a man looks at a print of a city.By a strange twist both the gallery in which he is standing and he himself are part of the print of the city. Escher left a mysterious white hole in the middle. In this lecture the mathematical structure of the print will be explained, and computer animations will show how the hole in the middle could be filled. 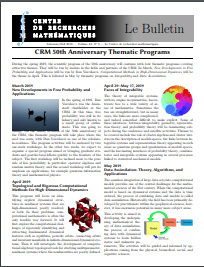 The CRM's "Grandes conférences" series invites scientists with a gift for communicating to present the most exciting recent developments in mathematics to a curious general public. From cryptography and quantum computing to chaos in meteorological or financial systems, and brain imagery and revolutions in biotechnology, all of the conferences reveal the power and beauty of cutting-edge mathematical research in a language accessible to all.